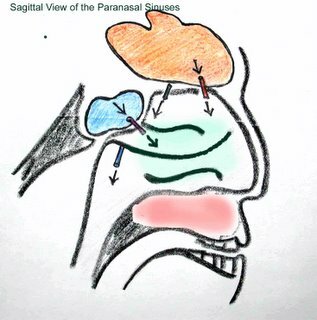 The paraorbital sinuses include the frontal sinus above the orbit (orange), the ethmoid sinuses (green) in the medial wall of the orbit, the sphenoid sinus (blue) that is posteriorly located and the maxillary sinus (purple-pink). Below, the sinuses are shown in a sagittal view. The maxillary sinus (red-pink) and the ethmoid sinuses would not be visible in the midline plane that shows the drainage from the sinuses (arrows). It is evident that the maxillary sinus is close to the teeth. Pain from the sinus may be referred to teeth. This occurs in maxillary sinus infections. Occasionally, normal teeth have been removed from patients with life threatening fungal sinus infections because this source of referred pain was unrecognized. Seven bones make up the orbit. Click on the photograph to enlarge and test yourself by naming the numbered bones. The roof of the orbit is composed of 2 bones, the frontal bone and the sphenoid bone. 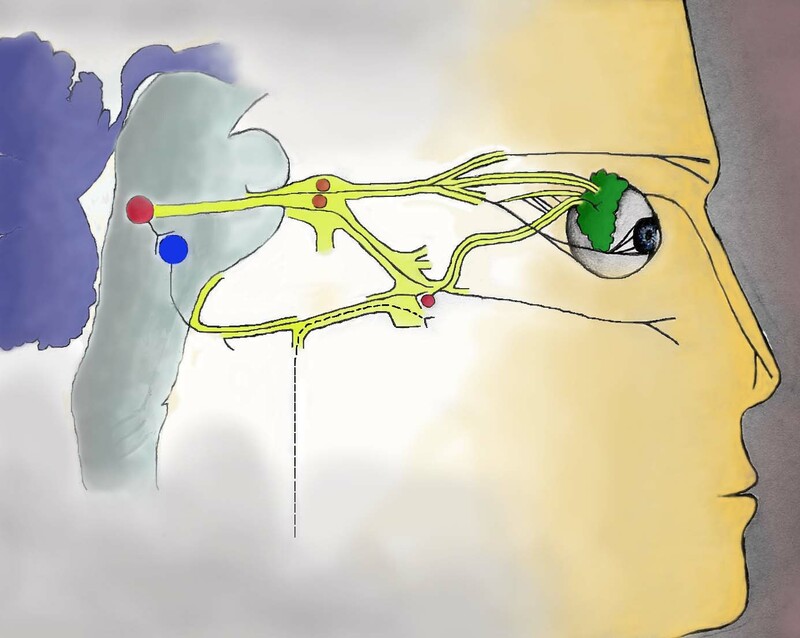 The frontal bone (#1 in blue) comprises anterior part of the roof of the orbit and the lesser wing of the sphenoid (#2 in tan) surrounds the optic canal and forms the posterior part of the roof. The medial wall of the orbit is composed of 4 bones: sphenoid, ethmoid, lacrimal and maxillary bone. 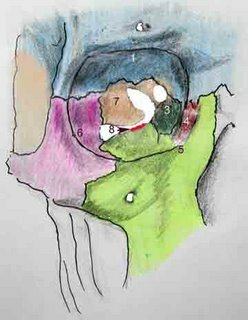 The lesser wing of the sphenoid (#2 in tan) is most posterior and is joined to the ethmoid bone (#3 in dark green), moving anteriorly to the lacrimal bone (#4 in light red) and then to the maxillary bone (#5 in light green). The floor of the orbit is composed of 3 bones: maxillary bone (#5 light green); zygoma (#6 in pink) and posteriorly the palantine bone (#8 in bright red). The palantine bone borders on the inferior orbital fissure. Notice that the inferior orbital fissure narrow posteriorly, a useful landmark in CT scans. The lateral wall of the orbit is composed of the zygoma (#6 in pink) and the greater wing of the sphenoid (#7 in tan). There is an important landmark on the zygoma that every ophthalmologist and emergency physician must know. The lateral orbital tubercle (that dark area above #6 in the figure) is the place where the lateral canthal tendon joins the orbit. The lateral canthal tendon, which is a fibrous extension of the tarsi of both eyelids, constrains the orbital contents. In traumatic injury with orbital hemorrhage the intraorbital pressure and intraocular pressure may rise high enough to snuff out blood flow and vision. In this case the lateral canthal tendon can be lysed at the lateral orbital tubercle. 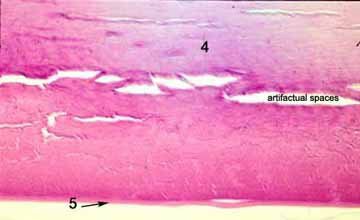 The inferior crux of the lateral canthal tendon can be divided as well. This emergency procedure, lateral canthotomy and cantholysis may prevent permanent vision loss. Some foramina or openings through the bones of the orbit and their associated contents are shown in this depiction of the boney posterior left orbit. It is important for students interested in ophthalmology to know the contents of these canals. With this knowledge, findings in such disorders as superior orbital fissue syndrome and carotid cavernous fistulas will make much more sense. See how many entering nerves and vessels you can name correctly. Backlighting of the cranial cavity with the skull-cap removed, exposes some foramina (optic canal, superior orbital fissure and pterygoid canal); light is shining in from the cranial cavity. The inferior orbital fissure does not enter the cranial cavity and therefore is relatively dark in this illustration. 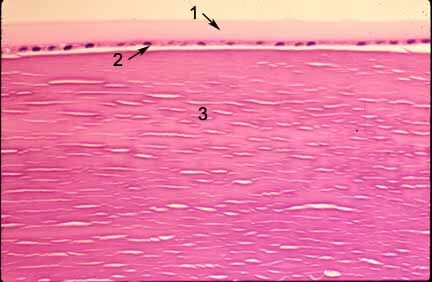 -Click to enlarge the diagram and photomicrographs and identify the structures, type of epithelial lining. -What is the length of tubing needed to cannulate the entire system from puncta to nose? -What is the diameter of the normal nasolacrimal duct? -What prevents mucous from traversing up the nasolacrimal duct with a giant SNEEZE!? -An infant presents at 3 months of age with tearing. What is the most probable cause and what treatment is indicated? -What is the source of oncocytomas in this location? Then Click on the link to retrieve the answers. 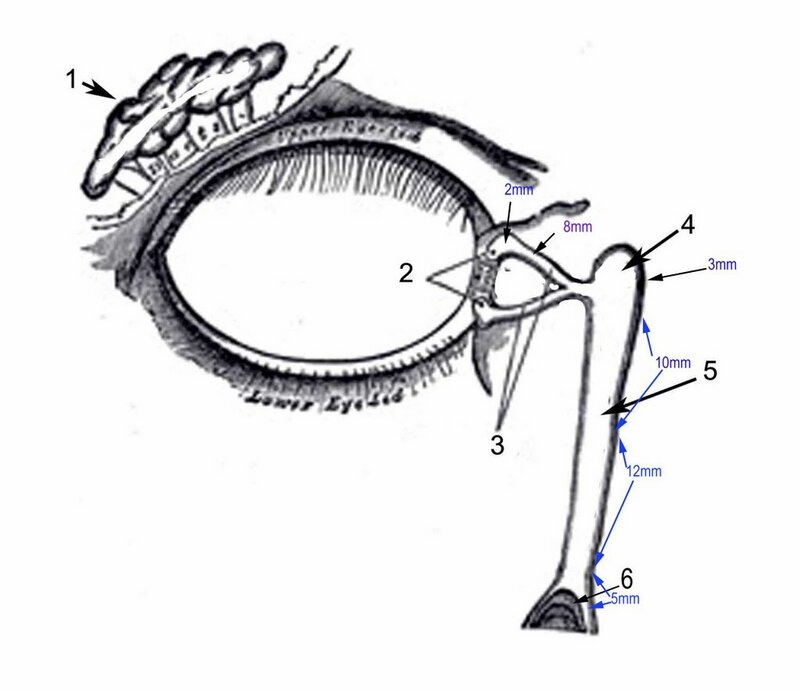 Tears are produced in the lacrimal gland (#1 in diagram to the left)exit the ocular surface via the puncta at the medial portion of the eyelids (#2 Diagram left). Each punctum is a small, round, or transversely oval aperture situated on a slight elevation. The puncta can be seen to be roughly in line with the openings of the Meibomian glands, the nearest of which is only 0.5 to 1 mm away. 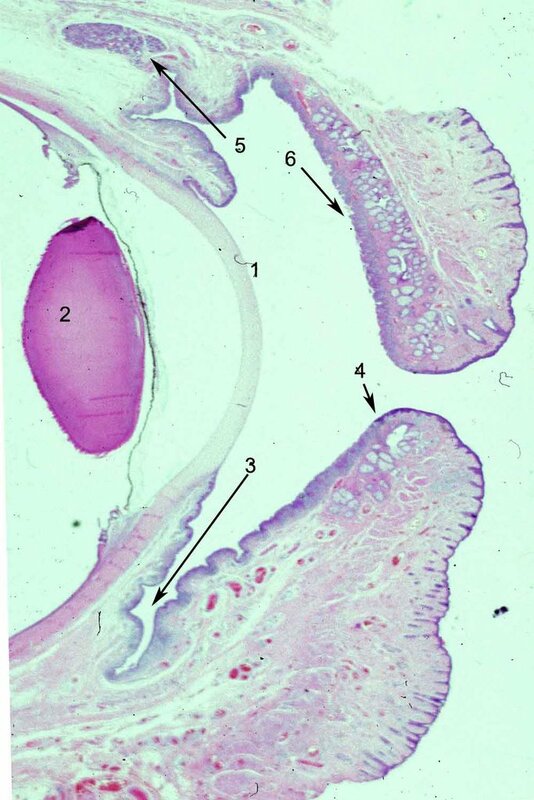 Each puncta empties into a canaliculus (Diagram left #3)which has at first a vertical (2 mm length) and then a horizontal (8 mm length) segment. 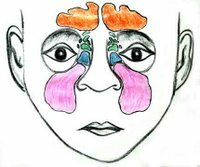 The canaliculi join in the common canaliculus and may dilate to be called the sinus of Maier which then transitions to the lacrimal sac. Photomicrographs below #'s 1 and 2). Click to enlarge the photograph. The puncta are positioned between conjunctiva (Photo below 3) and skin (Photo below #4) at the border of the eyelid. The lacrimal sac is placed in the lacrimal fossa (formed by the lacrimal bone and the frontal process of the maxilla) which lies in the anterior part of the medial wall of the orbit. The sac is closed above (Diagram above #4) and open below, where it is continuous with the naso-lacrimal duct (Diagram above #5). The upper portion of the lacrimal sac is called the fundus and the lower portion is called the body and the length of these segments, somewhat arbitrarily distinguished are about 3 and 10 mm respectively. The lacrimal sac joins the nasolacrimal duct which measures about 12 mm in length and 3-4 mm in diameter. 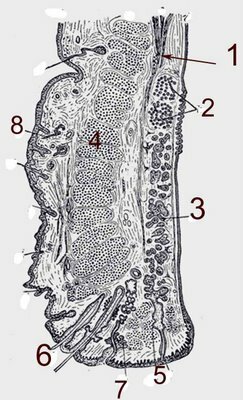 The lacrimal sac and duct are both lined by two layers of epithelium, the superficial of which is columnar, the deeper flattened. 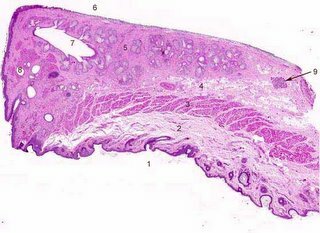 The epithelium of the lacrimal sac "stratified columnar" and may have areas that are ciliated and areas in which the superficial layer contains only Goblet cells and mucous. 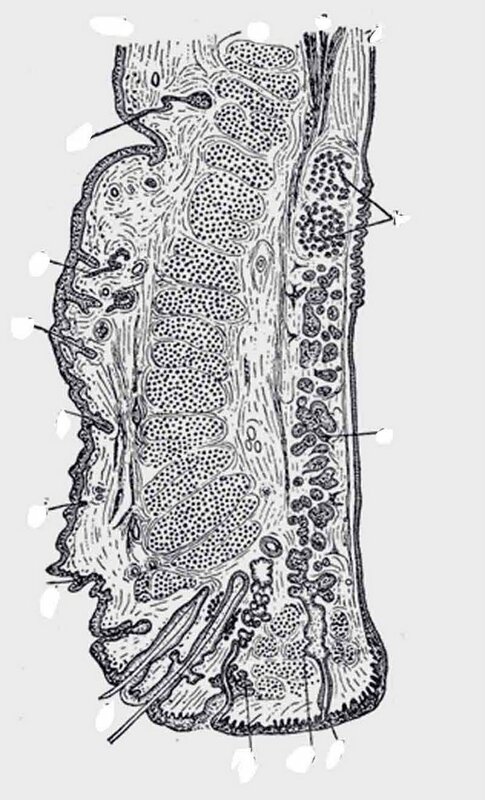 The bases of the columnar cells pass through the deeper layer to reach the basement membrane. The lacrimal sac has a papillary appearance with numerous infoldings. Occasional oncocytic cells may be evident particularly in lacrimal sacs that are chronically inflamed and are probably the source for oncocytomas that may affect the lacrimal sac. 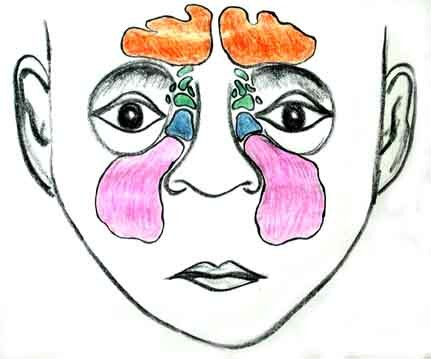 The nasolacrimal duct enters the nose at the inferior nasal meatus. The point of entry is called the lacrimal osteum and it is covered by a fold of nasal mucosa, the plica lacrimalis or if you prefer the valve of Hasner, that prevents mucous from entering the system in a retrograde fashion from the nose (with sneezing or "blowing one's nose against a handkerchief"). The "valve" of Hasner is closed in about 70% of newborns but opens spontaneously by 6-12 months. This is an important clinical point one must consider in an infant with tearing. By the way there is no end to eponyms for valves in this system if one wants to seem erudite. They are all folds of mucous membranes which have no real valvular function. The valves of Foltz or Bochdalek occur at the junction of the puncta and cannaliculus; the valve of Rosenmuller or Huschke occurs as the common cannaliculus enters the fundus of the lacrimal sac; the valve of Beraud or Krause occur at the junction of the fundus and body of the sac; the valve of Taillefer occurs at the sac-duct junction and of course the valve of Hasner also is called the valve of Cruveilhier or Bianchi. The lens is a transparent soft biconvex structure composed of crystallins. The adult lens measures about 9 mm in diameter and is 3.5 mm thick. 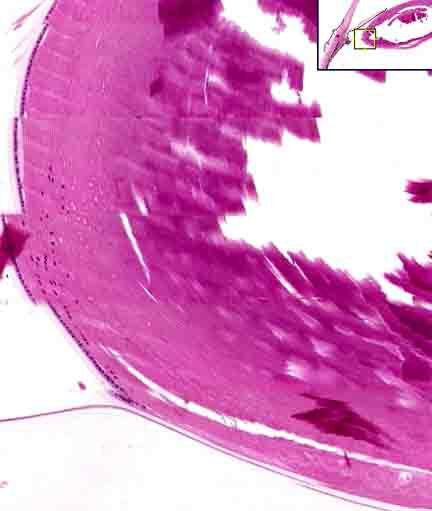 It is completely enveloped by the thickest basement membrane in the body, the capsule (#1 in photomicrograph ), which is 10-20 µm thick of hyaline material containing type IV collagen. 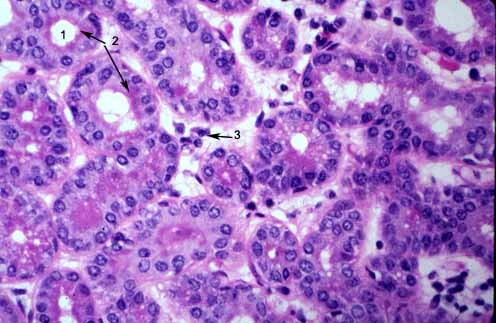 There is a layer of large cuboidal epithelial cells, (the lens epithelium) beneath the anterior capsule (#2 in photomicrograph). In the center (#3 in photomicrograph) tightly packed cells have lost their nuclei and become packed by special transparent proteins (crystallins) to form so-called lens fibers. New lens cells are added to the margin of the lens throughout life from the lens epithelium, but the cells at the cortex and nucleus (center) of the lens do not undergo turnover or replacement and are therefore the oldest cells in the body of an adult. The lens is avascular and nourished by diffusion from the aqueous and vitreous. The radius of curvature of th e anterior surface averages 10 mm, but it is subject to marked changes during accommodation. Because the lens nucleus is formed by increasing density of cortical cells, cortex and nucleus are considered together. Both are made up exclusively of cells derived from the lens epithelium. The common designation of “lens fiber” for the cortical cells is a misnomer for the elongated cells of the lens substance. Lens cortical cells are elongated and on cross-section, appear hexagonal in shape. The cortex resembles the cut surface of a honeycomb. In light microscopy, the transition from cortex to nucleus is characterized by less distinct lamellae. The posterior capsule (#5 in the photomicrographs) does not have any epithelium associated with it as the epithelium "migrates" anterior from the lens equator. Below is a photograph at the lens bow. Note the epithelium abruptly stops where the posterior capsule begins. Click to enlarge the photo and then use the back key to return. Click on the photographs to enlarge and identify the areas in the human lens. Then click on the link to see the answers. How many lacrimal glands are there in each orbit? Main (orbital and palpebral portions) + Glands of Krause (50) + Glands of Wolfring (5) + caruncle (1) = About 57! Which lacrimal glands can be identified in the photograph below? This is an anterior posterior section of the orbit cut in the vertical plane. Where is the main lacrimal gland? The lacrimal gland consists of an orbital or superior portion; and a small palpebral or inferior portion; which are continuous. Shaped like an almond the main lacrimal gland is situated above and lateral to the eye in the orbit in a shallow depression of the frontal bone. (The lacrimal gland does not lie in the lacrimal fossa or lacrimal bone where the nasolacrimal duct is!). The lacrimal gland secretes tears into ducts in the upper fornix. The lobules of the orbital portion of the lacrimal gland (#1 in photo above) are near the orbital septum. The levator muscle (4) initially lies under the lacrimal gland (#4 photo above) but the enfolds the palpebral portion. The bulbar portion continues forward and is contiguous with Muller's muscle. The levator inserts into the eyelid in a more anterior position than Mullers as fibers rejoin anterior to the palpebral lacrimal gland. The levator is posterior to the orbicularis that joins from beneath the skin and enters the eyelid. Where is the accessory lacrimal gland of Krause? The accessory lacrimal gland of Krause(#3 photo above) lies immediately adjacent to the fornix of the upper eyelid (#2 photo above). The glands of Krause are accessory lacrimal glands having the same structure as the main gland. They are placed deeply in the substantia propria of the upper fornix between the tarsus and the inferior lacrimal gland, of which they are offshoots. 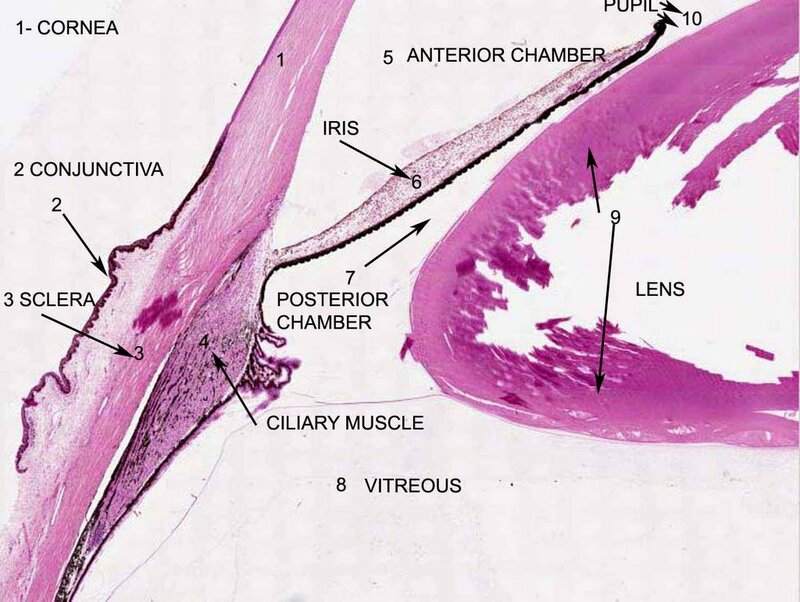 The sclera (5), ciliary body(6) and iris (7) are all identifiable in photograph above. How many accessory lacrimal glands of Krause are in the upper eyelid? How many accessory lacrimal glands of Krause are in the lower eyelid? There are some 42 in the upper fornix and 6 to 8 in the lower fornix. The glands of Krause are found largely on the lateral side of the orbit. Their ducts unite into a rather long duct or sinus which opens into the fornix. Are lacrimal glands a normal part of the caruncle? Similar lacrimal glands are found in the caruncle. (Check back for photo). Accessory Lacrimal glands of Wolfring. Identify the glands of Wolfring in the photograph. What structure corresponds to each letter? Where are the accessory lacrimal glands of Wolfring? 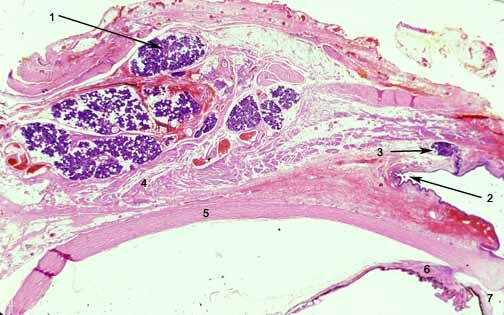 The Glands of Wolfring or Ciaccio are also accessory lacrimal glands, but larger than the glands of Krause. There are 2 to 5 in the upper lid and 1-3 in the lower lid, situated in the upper border of the tarsus midway between the end of the tarsal glands. In the photograph of a cross section of the eyelid, A points to one of the sebaceous glands embedded in the tarsus. B is a gland of Wolfring, C is a nerve and D is the orbicularis muscle. 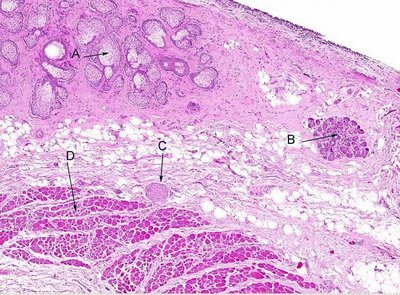 The excretory duct for the gland of Wolfring (not shown in the photograph) is large and short and lined by a basal layer of cubical cells and a superficial layer of cylindrical cells like the conjunctiva onto which it opens. Identify each of the numbered histologic features below. Photomicrograph (above) shows a higher magnfication of a human lacrimal gland complete with acinar structures that contain lumens (1) and protein rich acinar cells that secrete lysozyme, tear lipocalin, lactoferrin and IgA. The reddish granules (2) are secretory vesicles replete with protein. Some lumens are filled with protein that is being secreted. Lymphocytes and plasma cells are scattered in the interstitium(3). The lacrimal gland consists of a lobules and is a tubulo-racemose gland with short branched gland tubules somewhat similar to the parotid. The acini consist of two layers of cells placed on a thin hyaline basement membrane and surrounding a central lumen. 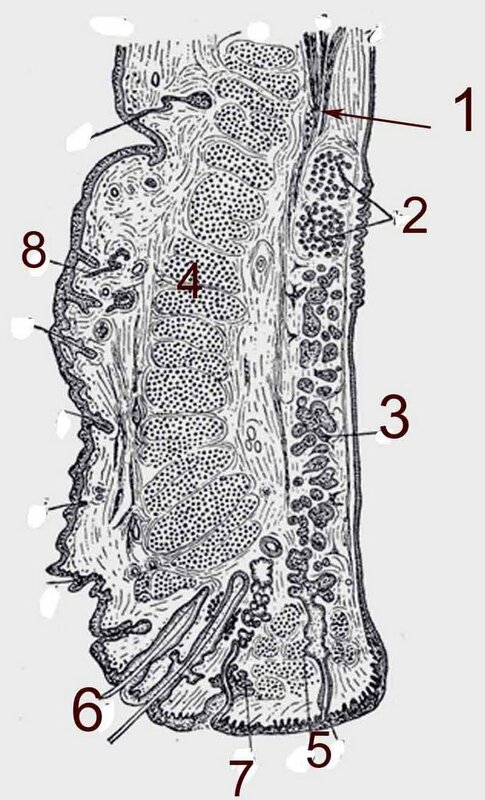 The basal cells are myoepithelial in character while the acinar cells are cylindrical, and secrete fluid into a series of ducts of increasing size until becoming the excretory duct. What species do not have lacrimal glands? The lacrimal gland and its tears exist in animals which live in air. Fish do not have lacrimal glands. What is the blood supply to the lacrimal glands? The arterial blood supply originates from the ophthalmic artery via the lacrimal artery. The lacrimal artery arises from the ophthalmic artery lateral to the optic nerve and runs forward along the upper border of the lateral rectus muscle in company with the lacrimal nerve. The drainage is to the lacrimal vein which joins the opthalmic vein. What is the innervation of the lacrimal gland? The lacrimal nerve provides sensory innervation. Describe the lacrimal reflex arc. The Vth cranial nerve is the afferent pathway from the sensory fibers in the nose and the corneal surface (arrow 1 in the figure below). Corneal fibers traverse the long posterior ciliary nerve in the sclera and exit posteriorly (arrow 2 in the figure below). 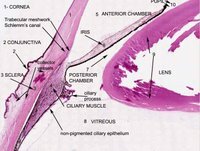 The fibers pass join the nasociliary nerve as the long sensory root (passing through the ciliary ganglion (arrow 3). The nasociliary nerve exits the orbit thru the superior orbital fissure and enters the cavernous sinus lateral to the internal carotid artery. 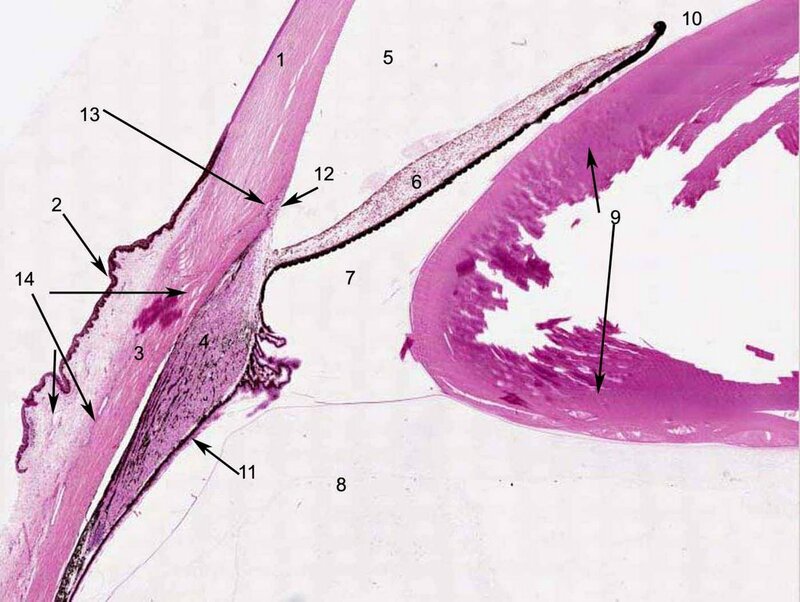 The nerve passes thru the trigeminal ganglion (also called semilunar or Gasserian ganglion, #4 in the figure below) which is present in Meckel's cave. From the trigeminal ganglion the fibers enter the pons and descend in the ipsilateral spinal trigeminal tract, synapsing in the most ventral portion (synapse 1, see figure- arrow 5). The output from the sensory nucleus is then to the lacrimal and salivatory nuclei (synapse 2, see figure- arrow 6). From here efferents (arrow 7) pass into the seventh nerve (nervus intermedius of the facial nerve) thru the geniculate ganglion (arrow 8), the greater or superficial petrosal nerve. The superficial petrosal nerve enters the pterygoid canal, continues in the pterygopalantine fossa and synapses in the pterygopalantine ganglion (synapse 3, arrow 9). Unmyelinated postganglionic parasympathetic fibers enter the inferior orbital fissure and form a retrobulbar plexus of nerves that include sympathetic fibers from the carotid plexus. 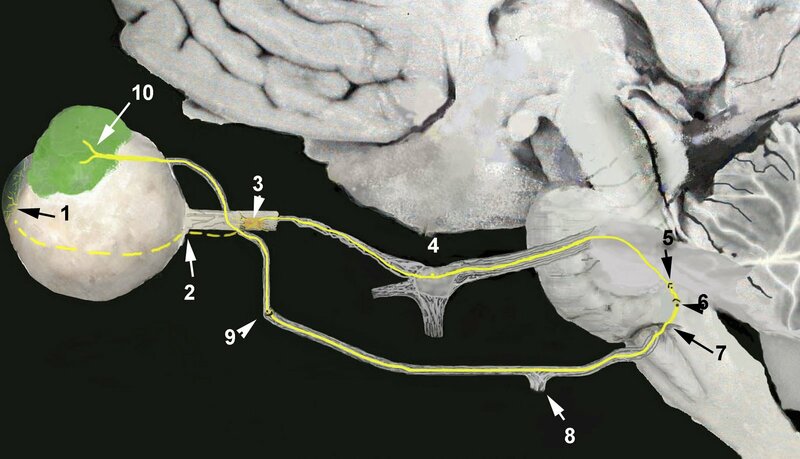 These nerves supply the lacrimal gland (arrow 10) as the rami oculares . Tear secretion is mediated by parasympathetic output and vasoactive intestinal polypeptide (VIP) mediated fibers (synapse 4). Describe the pathway for emotional tearing. 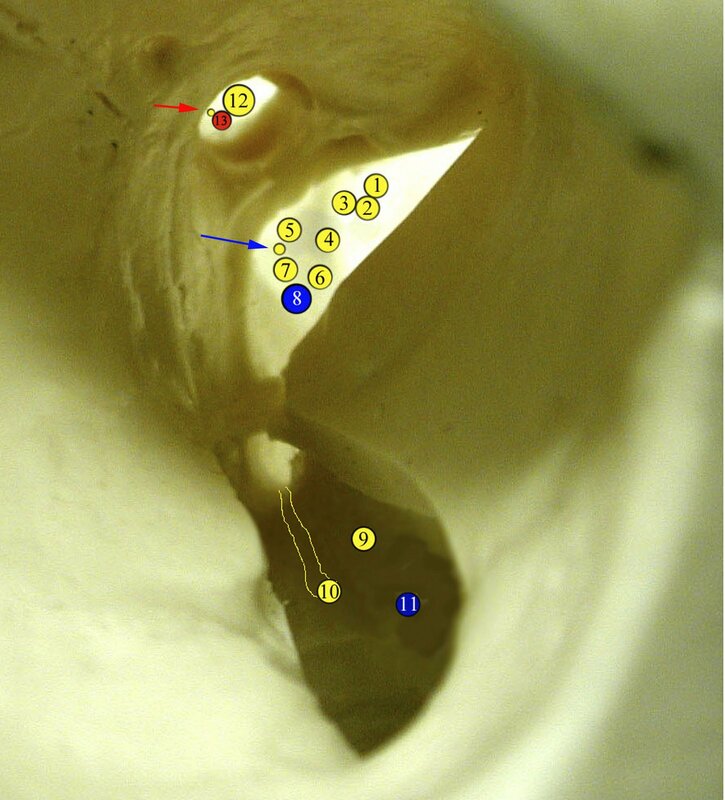 Afferents to the lacrimal nucleus from the hypothalamus with cortical input mediate emotional tearing. 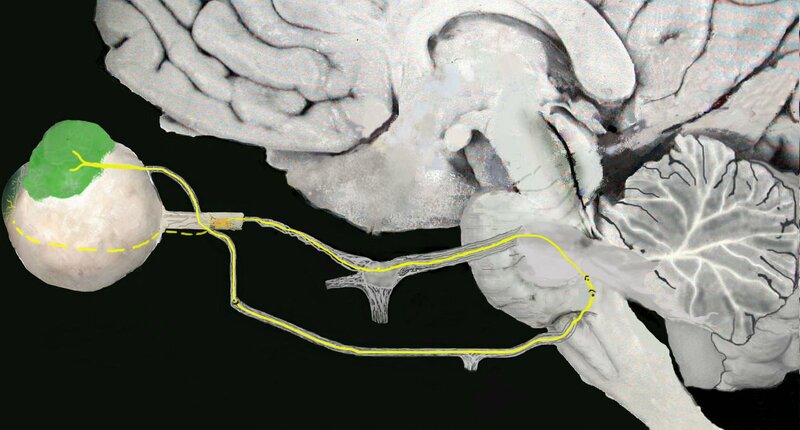 The pathway through the seventh nerve is identical as described for the reflex lacrimation. Here are some questions for you to keep in mind. 1. Name all the lacrimal glands of the orbit. 2. Approximately how many lacrimal glands are there? 3. Exactly, where are the main lacrimal glands? Do they rest in the lacrimal fossa? 4. What types of accessory lacrimal glands are present around the eye and where are they? 5. What do the lacrimal glands produce? 6. What organisms do not need lacrimal glands? 7. What is the blood supply to the lacrimal gland? 8. What is the innervation to the lacrimal gland? 9. Describe the lacrimal reflex arc for tearing. Please identify the structures shown in the photographs below. Click on the photos to enlarge them. Then link for the answers. CLICK ON THE PHOTO TO ENLARGE AND SEE THE ANSWERS. This photo is convenient to study the flow of aqueous from the ciliary epithelium of the ciliary body through the posterior chamber and the narrow space between the iris and lens into the anterior chamber and then in the anterior chamber angle and trabecular meshwork, Schlemm's canal and the collector vessels. Anatomic pertubations that may obstruct this flow include apposition of peripheral iris against the cornea (known as angle closure glaucoma), apposition of the iris against the lens because of rotation of the ciliary body leading to (malignant glaucoma), obstruction of the trabecular meshwork (such as in hemorrhage known as ghost cell glaucoma), adherence of the pupillary margin of the iris to the lens as after severe inflammation), and back pressure on the system such as a tumor that obstructs aqueous veins or a carotid cavernous sinus fistula that produces elevation of venous pressure and blood can sometimes be seen in aqueous veins.